Wintertime means a few things in rural Alaska. Dog mushing. Sub-zero temperatures. And basketball. Basketball is a cornerstone this time of the year in many villages, a gathering point for family members and fans to cheer on young players. 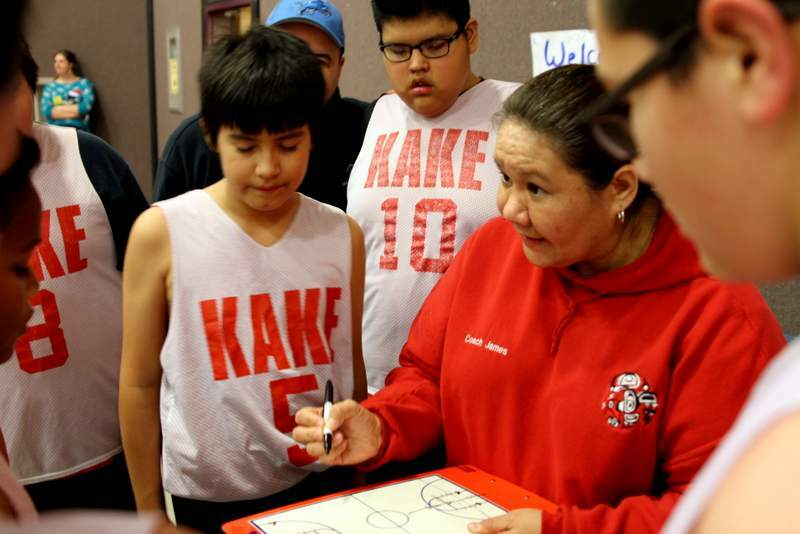 In Kake, a Tlingit village of roughly 500 people in Southeast, the basketball program has expanded in a big way. And it’s making a difference not only in how the players see the sport, but themselves as well. Dribbling. Net swishing. A subdued crowd in some city they’ve traveled to. But this winter, the Kake boys and girls had to adjust to a new sound. The sound of people they knew, cheering their names. 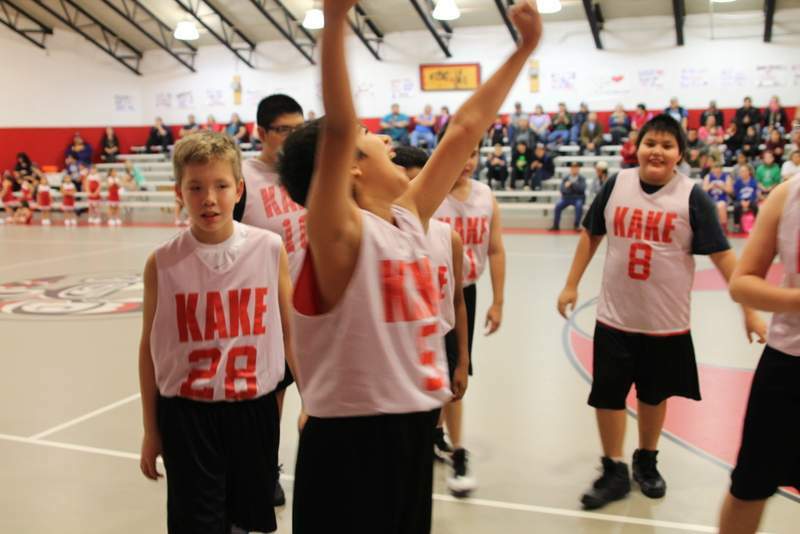 For the first time in six years, the Kake City School District is hosting home games for the junior high teams. 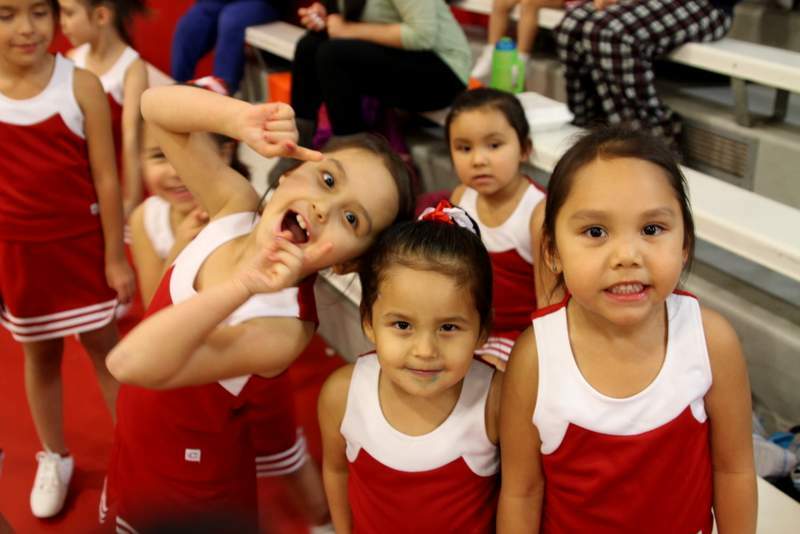 Two against Petersburg, for both boys and girls, and two against Sitka. And the gym tonight is packed. Kenny Aceveda, #8, is in 6th grade. “You get all pumped up,” Aceveda said. Tonight, Aceveda and his team are playing the Sitka Wolves. Aceveda’s just sank a shot that tied the game, 6 to 6. In that moment, he said it really does feel like your whole village is watching him. “It’s a little scary when you’re playing in a home town, but after awhile I got used to it so it doesn’t really bother me no more,” Aceveda said. 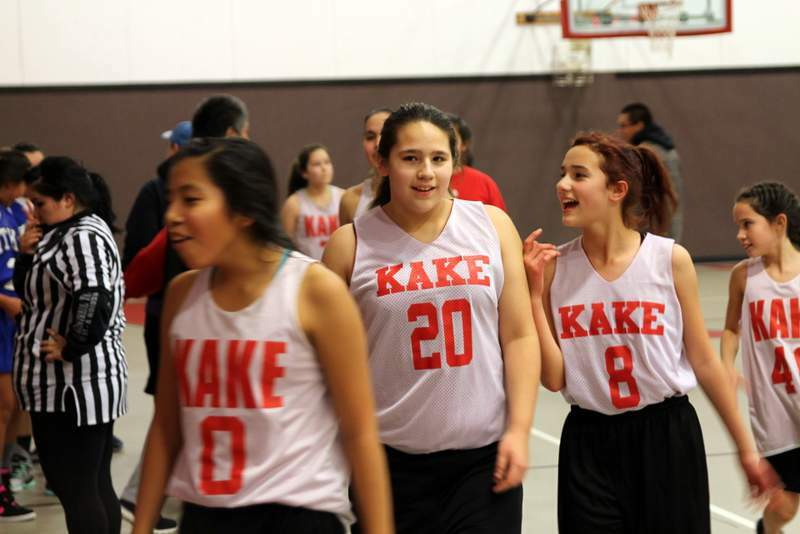 Nearly a fourth of Kake’s student population participates in the winter basketball season. In fact, it’s so many that during the junior high season, there aren’t enough be cheerleaders. So, the Boys and Girls Club recruits from within the preschool. I go over to chat with the pixie squad. They wear high ponytails, white sneakers, and chocolate ice cream all over their face. It’s halftime, the squad spills onto the court to cheer. At one point, they throw back their heads like lions and roar. Arthur Johnson is Kake’s Athletic Director. The district did not have a wrestling coach this winter, or enough student interest for mix six volleyball. So Johnson used that funding to restore home games to the middle school program. 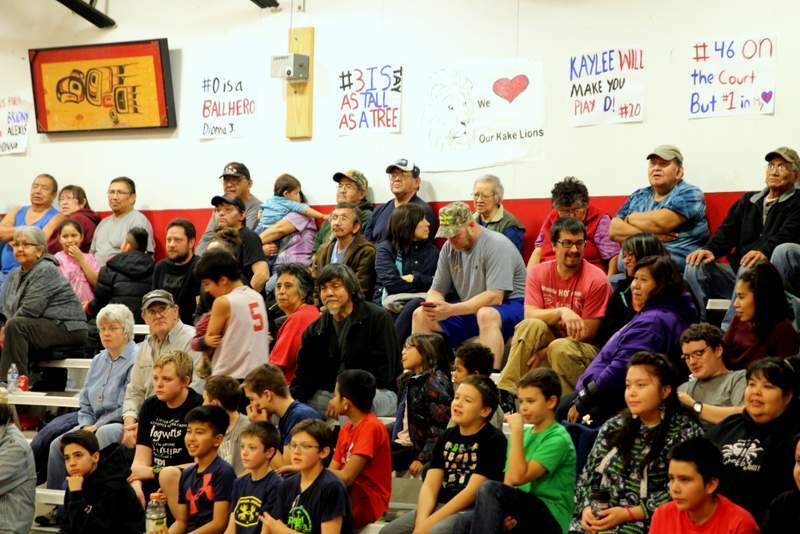 He’s still close with people he played against as kids, in villages like Yakutat and Hoonah. “They’ll have lifelong friends through playing basketball and traveling and representing our school,” Johnson said. The other goal is to feed the high school program. The high school girls won the regional 2A championship in 2015 and the boys in 2007. But, at the middle school age, Johnson thinks the experience of losing is just as important. That happens tonight, 16 to 29. But the Lions are good about it, filtering past the Sitka Huskies, slapping their hands. One of the loudest voices at the game is Debbie Johnson-James. When she was in high school, there was no girls team in Kake. And they did. Now, Johnson-James is the middle school coach and she makes all her players sign a contract to not drink soda or other sugar-sweetened beverages during the season. And basketball is a powerful antidote. You also have to keep your grades up to be eligible. “Student before athlete,” Coach Johnson-James said. Tomorrow is the last night of the season and for the students, that’s a hard loss to take. “This morning, Briony (she’s on the girls team) said, ‘Tomorrow is the last day until next year! I gotta wait a whole year for this again! '” Johnson-James said. To ease the transition, Coach Johnson-James always hosts a group pizza night. They’ll play a movie. Something inspiring. And the team is lucky in that they’ve got a coach straight out of the movies. And that, Johnson-James said, is the difference between just running down the court and actually playing basketball.